Rituals worshiping gods are bound to be associated with all kinds of pilgrimage, but when consequently taking form of huge festivals, they erode the boundaries of nationalities and religions. A resplendent example of this logical flow of events makes Thrissur in Kerala shine on the religious as well as tourism world map. 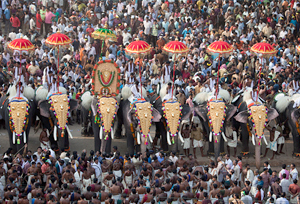 Who would be able to deny one memorable day spent in watching the activities of Thrissur Pooram? But this is not all one of the largest city of this southern state has on display. The city has religious and cultural roots that bind the history of the place so strongly that it is not easy to separate the two. Temples, museums, churches, art centers and the lush Nature for which Kerala is world renowned are some of the aspects of this cultural and spiritual capital of this southern state of India. One of these aspects is related with festival of Thrissur Pooram, celebrated in the Vadakkunnathan temple dedicated to Lord Shiva. Around this sacred space of 64 acres approx. the whole city is planned, developed strategically by Kochi King, H.H Sakthan Thampuran. The city is considered to be very old, related with the conception of state of Kerala itself when brought out of the sea by Lord Parasurama, a Lord Vishnu incarnation. Thrissur is supposed to be created immediately afterwards, followed by the establishment of the world renowned Shiva Temple in the middle. The city got the name 'Thir-Shiva-Perur', meaning 'Sacred City of Lord Shiva', shrinking to Thrissur later. British documented it as Trichur, which is even more contorted pronunciation. Among the oldest cities, it is recognized for historical connections with Buddhism and Jainism followed by the revival of Hinduism and emerged as the centre of education, learning and spirituality. Spirituality as expressed by Adwaita Vedanta propagated by Adi Shri Shankaracharya could still be seen rooted in the culture. The city as seen today as a commercial and cultural hub set up around the temple is the result of thoughtfulness and thoroughness of Kochi King Sakthan Thampuran. He was farsighted in his action of inviting business people then and providing allowances to set up and strengthen trade. 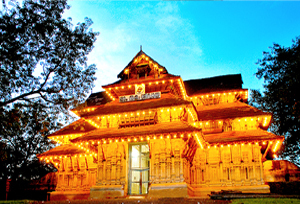 Moreover, he initiated the Thrissur Pooram, the biggest temple festival of India which is a most attractive way people now know the place as well as Kerala. Vadakkunnathan Temple: The temple is inside a circular boundary known as Swaraj with a giant square in front called as Thekkinkad Maidan, but the most attracting sight of inner and outer architecture that come to be identified as with that of Kerala only. Time is living here from more than thousand years and that could be seen and learnt here. The 3 idols of Mahavishnu, Shankaranarayan and Vadakkumnathan form the main shrines for worshipped. The sister temples of Thiruvambadi Krishna Temple and Paramekkavu Bhagwati Devi Temple are other attractions in the same premises. Shakthan Thampuran Palace: Located very near to the Vadakkunnathan temple, the landmark tells about Perumpadappu Swaroopam. Renovated recently, the palace exhibits the Dutch and Kerala architecture at once. The tomb of the King Shakthan Thampuran is also inside the palace along with the two other tombs. Just to the south of the palace, one can visit Heritage Garden, putting on display various rare plant and flower species, some of them are of medicinal value. Shankara Samadhi: The spiritual leader Adi Shankaracharya who epitomized the school of Advaita Vedanta was supposed to have travelled wide and far to preach his school of thought but believed to have returned to the city and eventually dying here. The Samadhi is located in a beautiful place, nearby which is a temple dedicated to the Guru. 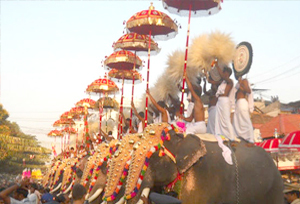 Thrissur Pooram: Celebrated in month of April and May every year, the festival is regarded as 'Poorams of all the Pooram', in the Thekkady square in front of the huge Shiva Temple. Elephant decorated with Nettipattam is one of the most awaited aspects of the festival showcasing more than 50 of them. By Air: For travel enthusiast from abroad, Kochi International Airport at 58 Km from the city is the nearest. Others options are can come down to Kozhikode and Coimbatore Airport not more than 80 and 115 Km respectively from the destination. By Road: Travelers like pilgrims and tourists can hire a taxi or rent a car in addition to the option of bus services flying on the route to Thrissur from places like Kochi, Chennai, Bangalore, Pollachi, etc.